ST. PAUL, Minn. (CNS) — In his famous work “Democracy in America,” published in 1831, Alexis de Tocqueville wrote: “Where education and freedom are the children of morality and religion … democracy … makes better choices than anywhere else. Bishop James D. Conley of Lincoln, Nebraska, made the case March 9 that those words remain true nearly two centuries later, and that Catholics need to engage in the public square. He made the comments in an address to more than 1,000 Catholics gathered for Minnesota’s first Catholics at the Capitol event. Organized by the Minnesota Catholic Conference, the education and advocacy event drew Catholics from every region of the state. 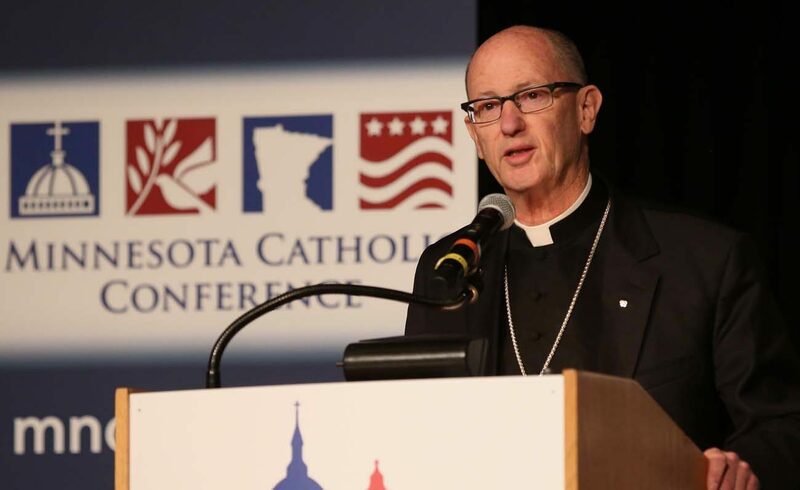 A member of the U.S. Conference of Catholic Bishops’ Ad Hoc Committee for Religious Liberty, Bishop Conley noted that the Minnesota Capitol stands at the confluence of streets named for two prominent American leaders: the Rev. Martin Luther King Jr. and Irish-born Archbishop John Ireland, St. Paul’s first archbishop. “Secular activists argue that our faith should stay out of the public square, that debates over public policy shouldn’t involve religious perspectives, (and) that we have no right to bring faith into the voting booth, or into the Capitol, or into the media,” he said. But, he said, America’s Founding Fathers saw things differently. “The Founding Fathers believed that well-formed believers were essential and critical for maintaining the social contract underlying the U.S. Constitution,” he said. “Public religious faith provides the ability to make moral judgments, which are rooted in a sense of common good rather than the individual good or personal gain,” Bishop Conley said. He said that our faith upholds a vision of the common good under which all people can flourish. During the last election cycle, many American Catholics considered themselves “politically homeless” because their values didn’t fit easily in either the Democratic or Republican parties. While it’s true that neither party represents a Catholic worldview, Catholics should not feel “homeless,” Bishop Conley said. “Today, in a world that is upside down, God calls us to stand on our heads … to see things as they are and to speak the truth,” he said, pointing to abortion and other life issues, marriage, and the need to help people who are poor, immigrant, refugees or incarcerated. Speaking truth might mean that Catholics lose friends, he said. “If we are faithful witnesses to the church’s teaching, we will make our neighbors from every political party unhappy and uncomfortable,” he said. Catholics also need to trust in God’s providence, he said. Success is measured by fidelity, not results, and God may use people’s efforts in ways they may never see.